It’s funny how summer goes fast. I have been doing everything else than writing my blog. This post has been waiting for a long time to be written; the first part of our journey to Ruovesi was written already a month ago. The next day we had the dog show or actually shows. 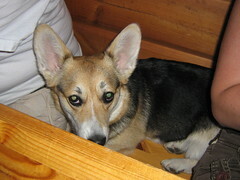 My dog is a Welsh Corgi Pembroke and my son and his girlfriend have a Welsh Corgi Cardigan. They competed in totally different shows. As you can see later in the pictures they look very much alike. 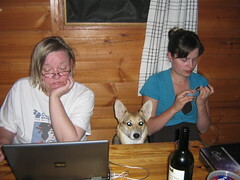 In the evening I was writing my blog and as you can see, Piitu always wants to be in the spot light. She just jumped and sat on the bench taking care that she saw everything. Piitu has a “cage” made of fabric and Lulu fitted there with her. the problem with this is that Piitu can open the zipper if it is not secured. The next pictures are from Piitu’s performance. She got again graded very good, but not excellent. She is too enthusiastic walking and she had never practiced on grass before. Here is Lulu. She got graded excellent and also was the winner of the intermediate (young dogs) class. She got two nice badges but unfortunately I have not pictures of them. The last picture is funny and we have actually two looking exactly the same. My son was jumping over a ditch and got Piitu jumping also. My daughter tried to catch Piitu in the picture, but here is the result. She was so fast, that all seen in the picture are my son’s feet. LOL! Nice pics....the dogs look like twins! Nice names btw....so sweet!!! Piitu looks very eager and the other one is very very sweet....Looks like u people r having a great time! Long time....no see....keep visiting....keep in touch! Congratulations! Well done, I wouldn't know whether your dogs are up to the standards but I find them very cute!